Researchers from Korea and China have developed a method to synthesize large sheets of monolayer single-crystal graphene. Polycrystalline graphene is formed by randomly oriented graphene islands, which decreases its quality. Currently, scientists can grow meter-sized polycrystalline graphene and smaller sizes of the usually higher-quality single-crystal graphene, ranging from 0.01 mm2 to a few square centimeters. The synthesis of large single-crystal graphene at a low cost is considered a desirable goal. In this study, the team reported the synthesis of a large sheet of monolayer single-crystal graphene. The researchers grew graphene on the surface of a 5 × 50 cm2 copper foil, which was transformed into a single-crystal copper foil by heating to approximately 1,030 degrees Celsius. A temperature slope from hot to cold moved the so-called grain boundary onward, creating a perfect single crystal. During the heating and cooling treatment, copper atoms migrated inside the material, arranging into an ordered structure with fewer defects. Then, using chemical vapor deposition, millions of parallel graphene islands were formed on the copper foil surface. As more carbon atoms deposit on the foil, the islands kept on growing until they coalesced and formed a very-close-to-perfect single-crystal graphene layer that covered the entire available surface. “The secret to obtaining single-crystal graphene of a very large size is to have a perfect single crystal copper as a base to start with. Large single-crystal copper foils are not available in the market, so labs must build it with their own means,” explained the team. The team’s findings may allow a leap forward in graphene production, advancing from a technique that synthesizes a few square centimeters of single-crystal graphene in a couple of hours, to an optimized method that allows the creation of an almost-perfect (> 99.9 percent aligned) 5 × 50 cm2 single-crystal graphene in just 20 minutes. 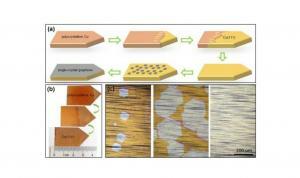 Moreover, the low production costs, comparable to commercially available lower quality polycrystalline graphene films, could expand its usability.